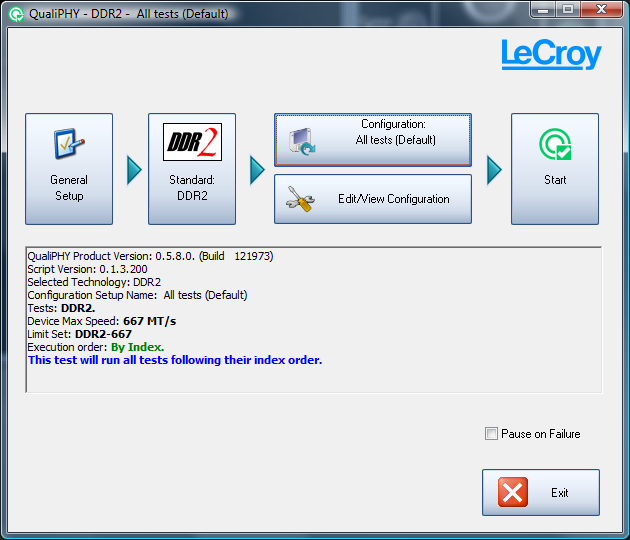 The Teledyne LeCroy QualiPHY platform provides an easy to configure user interface, allows for custom test and limit selection, displays connection diagrams to the user to ensure proper connectivity, and generates reports with all of the results including screenshots of the worst case failures for each applicable test. 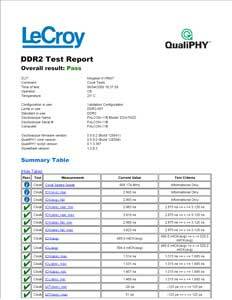 In addition, all of the waveforms tested by QPHY-DDR2 can be saved to easily share information or rerun the tests at a later time. 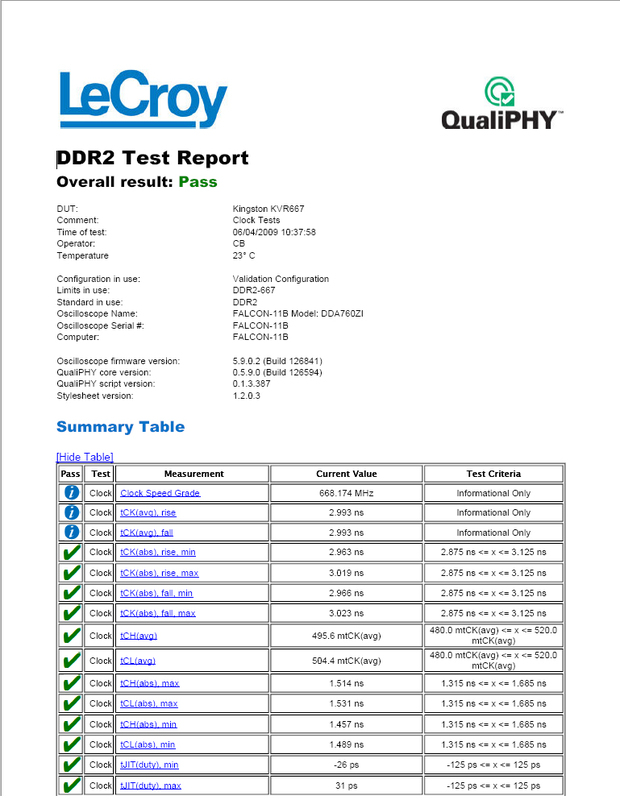 QPHY-DDR2 enables the user to obtain the highest level of confidence in their DDR2 interface. 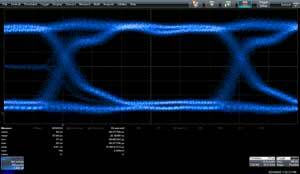 Due to the high level of variability in DDR2 measurements it is important to measure a large number of cycles. By measuring a large number of cycles in a very short period of time the user can be more confident that they are catching the true maximum and minimum points for their measurement. 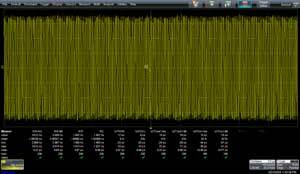 In addition to automated characterization of DDR2 signals, QPHY-DDR2 also enables powerful debug capability for DDR2 signals inside the oscilloscope. 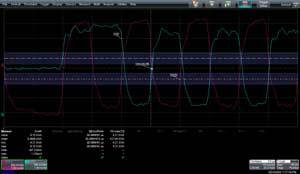 Root causes of failure can be quickly and easily found using all of the advanced serial data tools within the oscilloscope. These include: SDA II, Eye Doctor™ II, WaveScan™, and many more. Clock Tests – These tests perform all of the clock test as described by the appropriate JEDEC specification. 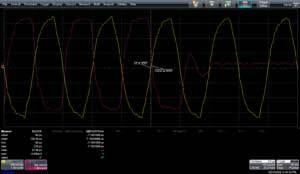 These include average clock period, absolute clock period, average high/low pulse width, absolute high/low pulse width, half period jitter, clock period jitter, cycle-to-cycle period jitter and cumulative error over n period tests. Electrical Tests – These tests measure the electrical characteristics of the DDR2 signals. Shown above, the SoutR test measures the slew rates of the data, strobe and clock signals. Over 1000 slew rate measurements were performed and the worst instance was displayed on the screen. The signals are annotated with the signal names to make the screen easy to interpret. 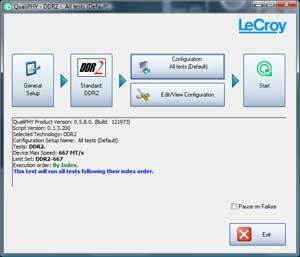 Additionally, cursors are used to show the user the voltage levels between which the slew rate was measured. 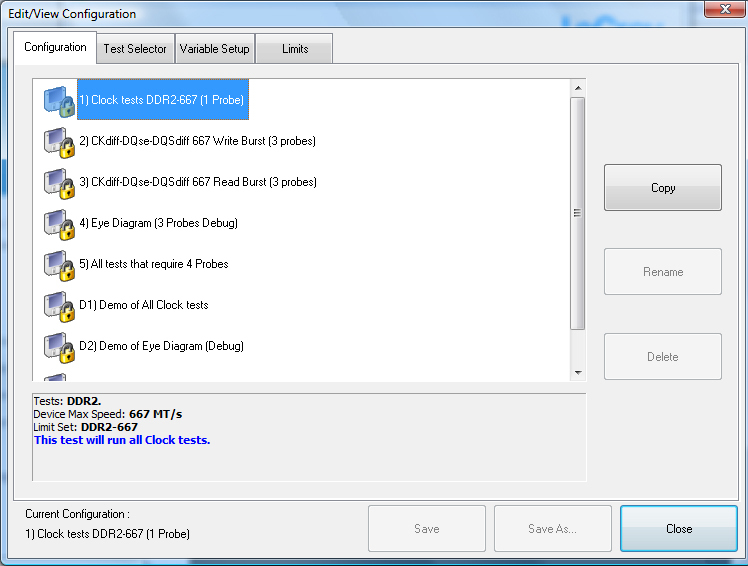 Timing Test – These tests verify the timing relationship between particular DDR2 events. 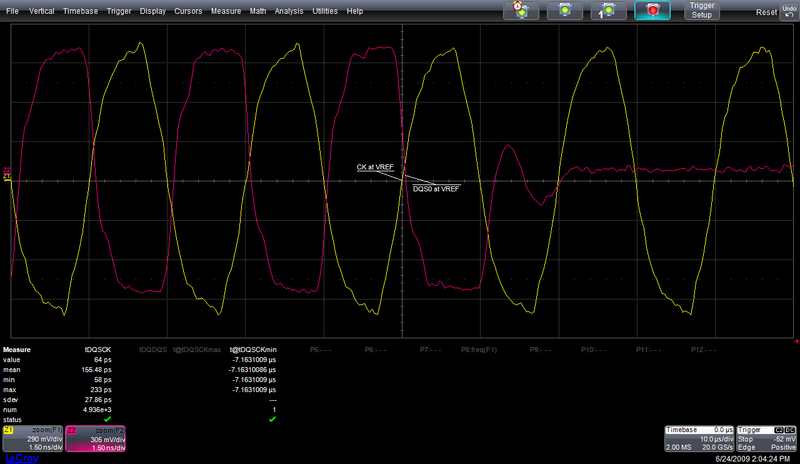 Shown above, the tDQSCK test verifies that the strobe output access time from the clock signal is within the limit specified by the appropriate JEDEC specification. In this test, 5000 tDQSCK measurements were performed on all of the DDR2 read bursts and the worst instance was displayed on the screen. 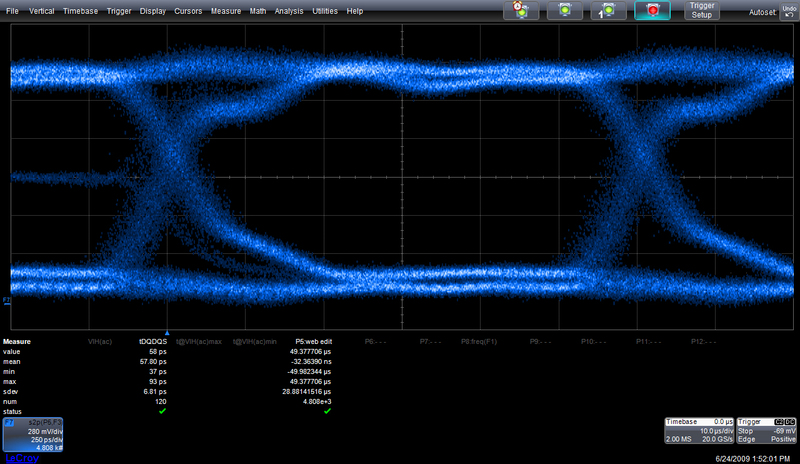 Eye Diagrams – Eye Diagrams are a powerful tool for debugging serial data signals. 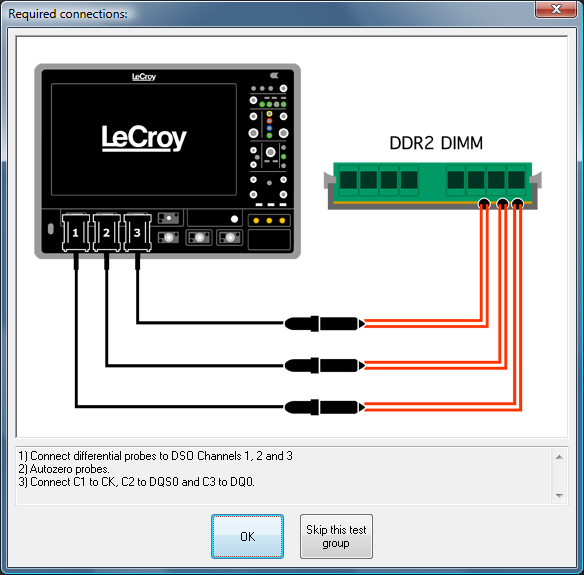 QPHY-DDR2 enables the user to create eye diagrams of both the Read and the Write data bursts to ensure that the signal integrity is sufficient such that the data will be sampled properly by the receiver. Connection Diagrams prompt the user to make the necessary connections..
QualiPHY helps the user perform testing the right way -- every time!